Authors: Philipp Girichidis et. al. Galaxy evolution is a game of balance. Galaxies grow as they accumulate gas from what is called the intergalactic medium and as they merge with smaller galaxies. Over time, galaxies convert their gas into stars. This inflow of gas and the subsequent star formation is balanced out by the outflow of gas from galactic winds, through a process known as feedback. As suggested by observations and seen in simulations, these winds are driven by supernovae explosions that occur as stars die. Eventually, gas driven out may eventually fall back into the galaxy, continuing a stellar circle of life. Although simulations have done a good job reproducing galaxy properties worrying about feedback from supernovae alone, this is far from the complete picture. Cosmic rays, or high energy protons, electrons, and nuclei moving near the speed of light, can create a significant pressure in galaxies through collisions with the gas in galaxies. Supernovae explosions are important sources of cosmic rays in galaxies. Simulating cosmic rays is computationally challenging, yet they may be very important for understanding the life cycle and structure of galaxies. In addition, since cosmic rays are charged particles, worrying about how they interact with magnetic fields in galaxies may be very important. The authors of today’s astrobite use hydrodynamic simulations with magnetic fields (or magnetohydrodynamics, MHD), cosmic rays, and supernovae to try and better understand their roles in driving galactic winds. The authors aim to understand how supernovae, magnetic fields, and cosmic rays affect the evolution of gas contained within the disk of a galaxy. In particular, their test is to see what, if any, of the three best reproduces the density and temperature distribution of gas as a function of height above the gas disk. They perform three simulations of a galaxy disk, all three of which include magnetic fields. One simulation includes the thermal energy injected by supernovae explosions only, one includes cosmic rays generated by supernovae only, and the third includes both. The gas density of these three simulations are shown (left to right) in Figure 1, 250 million years after the start of the simulation. 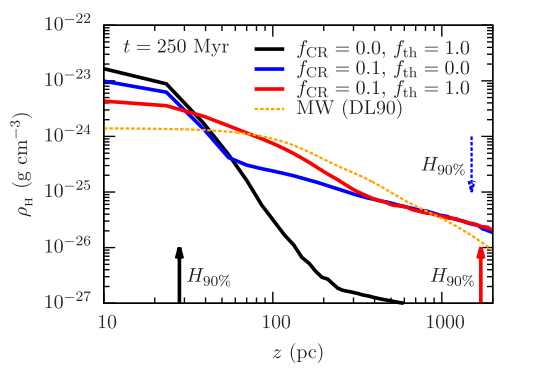 Putting numbers to Figure 1, Figure 2 shows the gas density as a function of height above the disk for all three simulations: thermal supernovae energy only (black), cosmic rays only (blue), and both (red). The vertical lines show the position within which each simulation contains 90% of the gas mass. As shown, including only thermal supernovae energy produces a dense disk, with little gas above the disk. Adding in cosmic rays changes this significantly, driving out quite a lot of gas mass to large heights above the disk. This is in part because cosmic rays are able to quickly diffuse to large distances above the disk. The gas from the disk then flows out from the disk to large heights, following the large pressure gradient established by the cosmic rays. The cosmic ray simulations do a much better job of matching the yellow line, which gives observational estimates of the gas density above the disk of our Milky Way. In addition, the authors go on to show that, over time, including cosmic rays serves to slowly grow the thickness of the gas disk, and quickly dumps gas at large heights above the disk. They also show that the mass flow rate of galactic winds generated by cosmic rays is nearly an order of magnitude greater than those generated by thermal energy injection alone. This research aims to better describe the evolution of galaxies by including the effects of supernovae feedback as well as the not-well-understood effects of cosmic rays and magnetic fields in their simulations. Their work shows that cosmic rays are able to dive out a significant amount of gas from the disks of galaxies, potentially tilting the balance between gas inflow and star formation, and gas outflow. Understanding this process better with further work will bring the properties of simulated galaxies in better agreement with observed galaxies in our Universe.